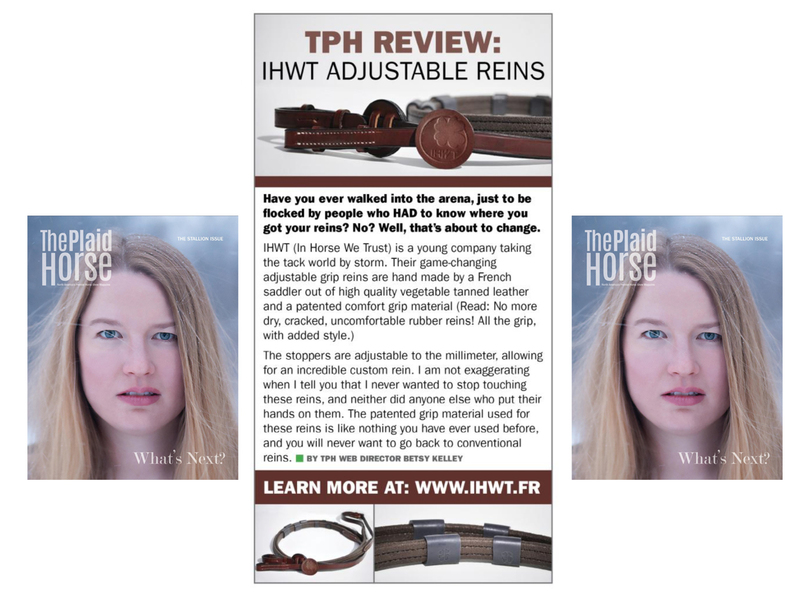 A new revolution on the market, we came in contact with In Horse We Trust, two french ladies that invented a new all-in-one rein. Described as reins that won’t meld even when you light them on fire, promising is it not? Our Equteam made the test and tested a set of the In Horse We Trust reins. IHWT is a young company taking the tack world by storm. The French ladies behind this brand introduce a game-changing adjustable grip reins that are hand made in France. 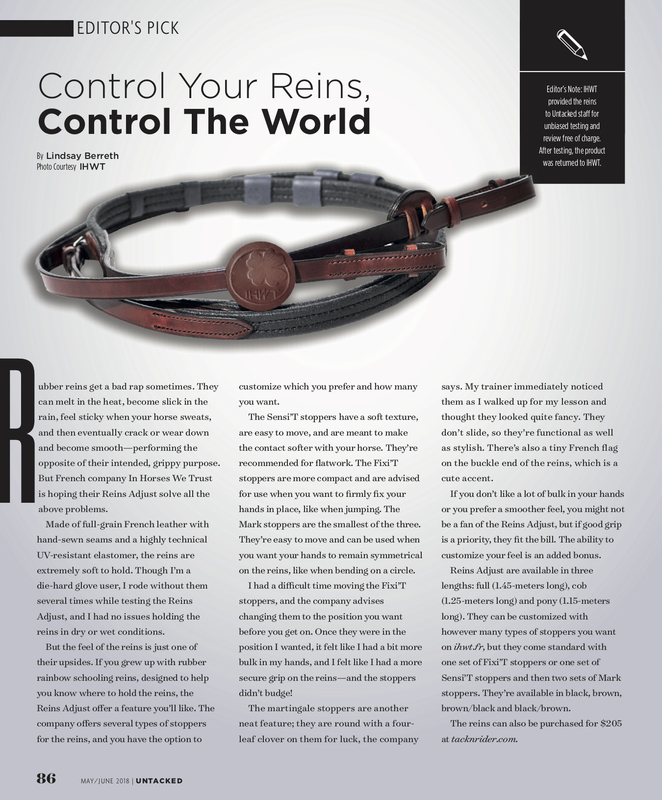 The reins are developed with high quality vegetable tanned leather and have a patented comfort grip material. This prevents the leather of drying, cracking and ensures you no longer have uncomfortable leather/rubber reins. Our riders loved it! The reins provide a lot of grip and even when the horse sweats, the grip stays. Also the stoppers are adjustable to the millimeter, allowing for an incredible custom rein. “The reins feel very comfortable, although it’s rubber, they have a sort of special feel you don’t want to let go, ” states five-star showjumping rider Damien Haelterman. “We also like the fact the technics are combined with a nice design, bringing reins to a new type of level…” reveals Jean-Christophe de Grande. “I also liked the fact I could set the rubber end-pieces on a perfect length, helping me to have my reins on the same length at every moment when riding.” Maybe one feature, the adjustable rubber grips are a bit stubborn in the beginning, but they adjust quickly. You know that feeling that you have in your hand at that exact moment that your horse is on the bit, in balance, over his back, all of those dressage-y terms that we all only sort of understand? …and then you lose your grip or open your fingers slightly, and it all disappears. Your horse is back to being a giraffe watching planes in the sky. ou can comfortably ride with these reins sans gloves, and your hands will not be the slightest bit calloused at the end of the ride. Get the full review here ! Heels Down Magazine presents the Heels Down Happy Hour podcast. Listen to the podcast #14 talking about the reins Adjust 😀 (jump to 15m25) HERE! Caroline reviews the In Horse We Trust Reins, which apparently won’t melt even when you light them on fire. 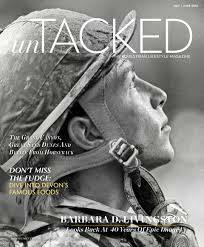 There’s a whole lot of stuff happening in the horse world, and someone’s got to keep you up to date. Who’s winning what? What weird rules are you probably going to violate at your next horse show? What does your favorite rider really think about white breeches? Don’t worry, that’s what we’re here for. Grab a drink. Welcome to Happy Hour. Check this address regularly to find out all the news of In Horse We Trust.